As Lando plummets to the planet below, Lobot grabs an emergency rocket vest and manages to slow their descent enough to land safely on Bespin. They then work with some local Ugnaughts to defeat an Imperial patrol, and the Ugnaughts agree to take Lando to their leader. 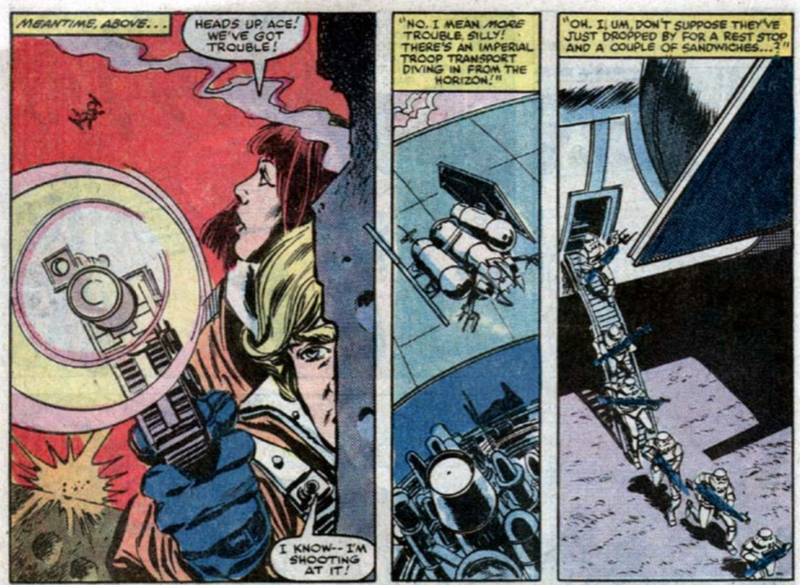 Meanwhile, Luke & Shira arrive on Bespin. 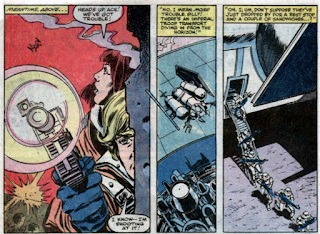 Spotting them & recognizing Luke, Treece attempts to capture them so he can present Luke to Vader. On the planet below, Lando learns the Empire had enslaved the Ugnaughts on Cloud City, and outraged, vows to help them retake the city. 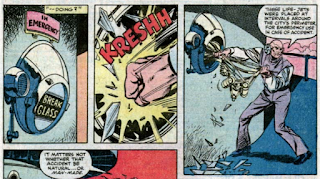 They arrive just in time to relieve a pinned-down Luke & Shira, and Luke uses the Force to seemingly detonate the Ugnaughts' remaining bombs, sending the city crashing down. Believing the place lost, Treece and the Imperials evacuate, after which the city stops falling and Luke reveals he only detonated the primers, triggering smaller explosions that temporarily caused the city to fall. With the Empire believing the city destroyed, Lando leaves Lobot & the Ugnaughts in charge, then he, Luke & Shira set off for home. 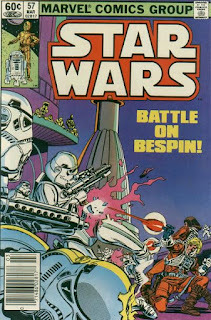 After suggesting last issue that Bespin is not a gas planet, this issue brings Lando & Lobot to the planet's (very solid) surface. 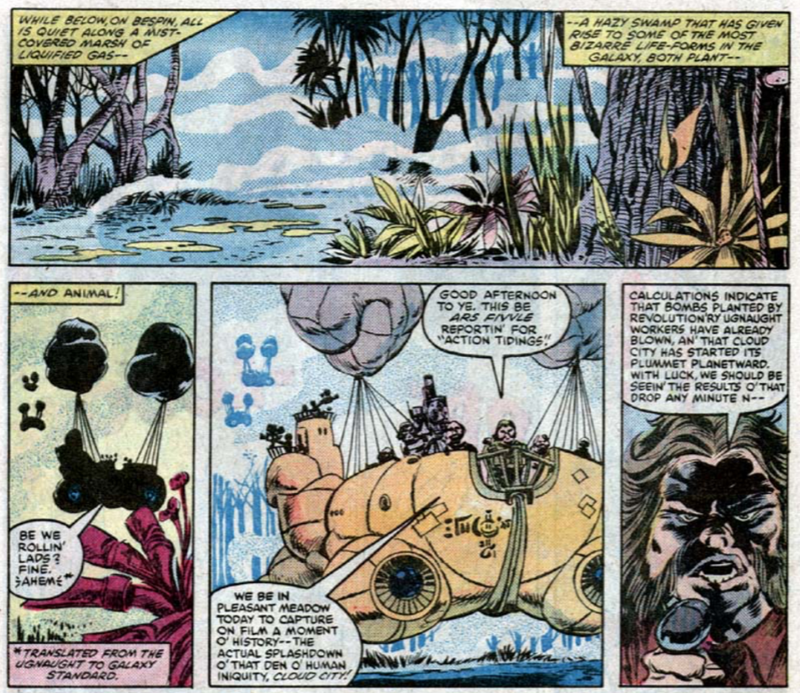 It also shows something of the Ugnaught's society (they have a king, with whom Lando has had past dealings), and their language, which, when translated into Basic/Galactic Standard, resembles some kind of Celtic brogue. 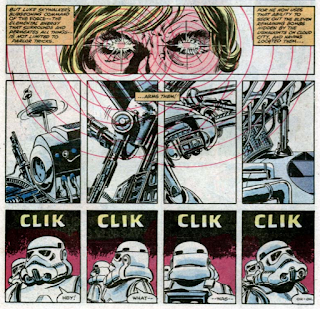 Luke is able to use the Force to not just arm all eleven remaining Ugnaught bombs planted throughout Cloud City, but only arm their primer explosives, thus creating the impression that all the bombs have fully detonated, demonstrating an unprecedented level of power and precision in Force usage for him. 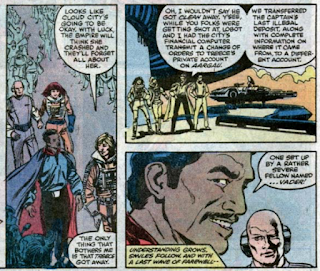 Lando references Treece's secret bank account on Aargau; that is the banking world which Leia visited in issue #48. Treece crows that capturing Luke will guarantee him a seat on the Imperial Senate; the Senate was rather notably dissolved off-camera in A New Hope. Cloud City apparently has rocket packs staged throughout in the event someone tumbles over the edge, complete with "break in case of emergency" written on them. Apparently rest stops and sandwiches are known commodities in the Star Wars galaxy. Generally speaking, I've never been terribly bothered by this series' loose association with official Star Wars canon. For one thing, it's always had a strange relationship with canon, every since I first became aware of it (after I started reading the Dark Horse comics/Bantam novels of the early 90s); for another, the canon I grew up reading, in which this series was only ever sort-of referenced, as now been rendered just as non-canonical as this series was then, illustrating just how superfluous and nebulous the notion of "which stories count" can be. A well-told story is a well-told story, whether or not it "counts" in the grand scheme of a series' ongoing narrative, and I've done my best in reading this series to not discount a story just because it largely contradicts something later established as official canon. 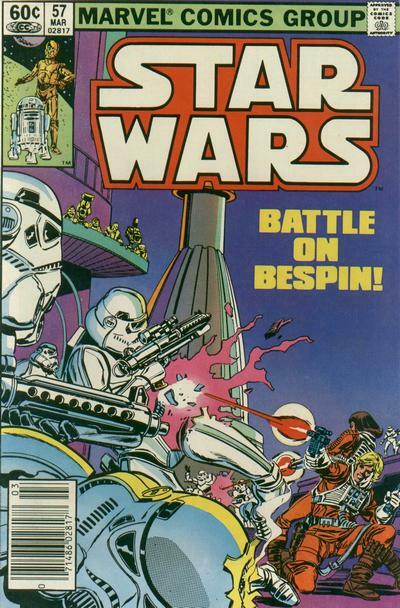 All that said, I'm having a really hard time enjoying this issue simply due to its depiction of Bespin as a planet with a solid, jungle terrain populated by Ugnaughts with some kind of Irish/Scottish brogue (translated, of course). Playing around with the Ugnaughts is fine - it's straight out of the Expanded Universe playbook, specifically the "explore the culture of a briefly-featured alien species from one of the movies" chapter, and with Empire having left Cloud City in Imperial control, it enables this story to do another EU staple, the "Rebels help an Imperial-oppressed people fight back" narrative. But I just have a hard time getting over Bespin as anything other than a gas giant. I mean, that's the whole point of Cloud City, that it's harvesting Bespin's gases as a natural resource! When it comes to fiction, everyone has their suspension-of-disbelief breaking point, and any kind of serialized, shared narrative with its own internal continuity provides more of those than the average story. For whatever reason, this whole Bespin thing (which is, admittedly, a relative minor point of complaint) is that for me, making it difficult for me to fully appreciate this. It's always funny what our disbelief-breaking point is! But I always joke to people that Star Wars is about dudes wearing capes and carrying laser swords a long time ago in a galaxy far far away, which, let's be honest, is utterly silly! 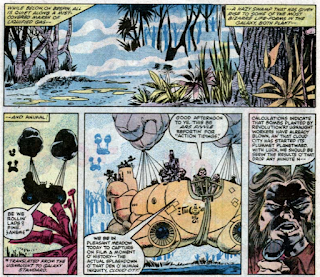 In this issue a caption on the splash page mentions that it is a gas planet, and just a couple of pages later — in the panels you share — one refers to the surface as a “marsh of liquefied gas”. 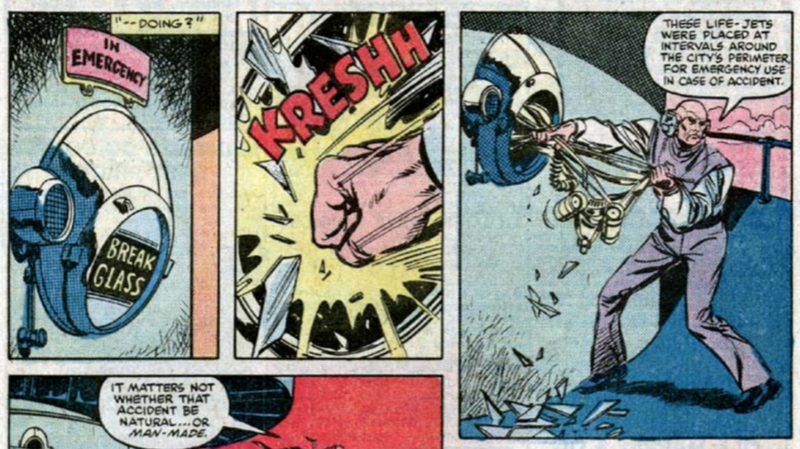 Maybe the creative team already had that worked out, and maybe Lucasfilm (or just a fan amongst their friends or the Marvel bullpenners) gave them a heads-up after #56 that forced them to reconcile things as best they could. I wonder. Many of whom are obsessed with reporting on breaking news — for their equivalent of television, it seems, although while we see the film crew with mikes and cameras we don’t see anybody watching back home. There’s one for Just Yesterday, In a Galaxy Surprisingly Close By.